Did you guys enjoy the premiere of Game of Thrones last night? If so, what’d you think of it? I loved it but I was bummed there wasn’t more Richard. Looks like there’ll be more next week though. Check out the preview for “The Kingsroad” below. Hey everyone! 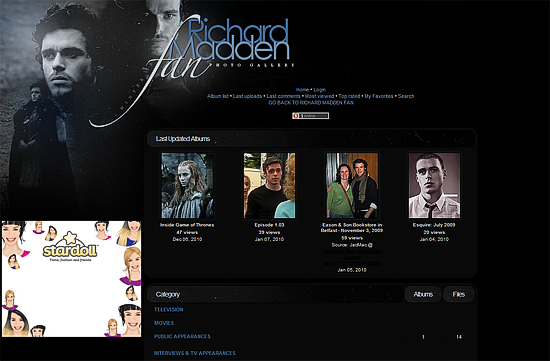 I’m the new owner of Richard Madden Fan and for my first update I’ve capped some of the missing features/trailers from The Game of Thrones. Check out the gallery for the newest additions. View some previews below. Thanks to Laura we finally have changed the theme at the gallery, take a look, it’s beautiful! HBO confirmed “Game of Thrones” will premiere next spring.